“We believe more strongly than ever that the time has come for new leadership in our caucus,” the Democrats wrote. 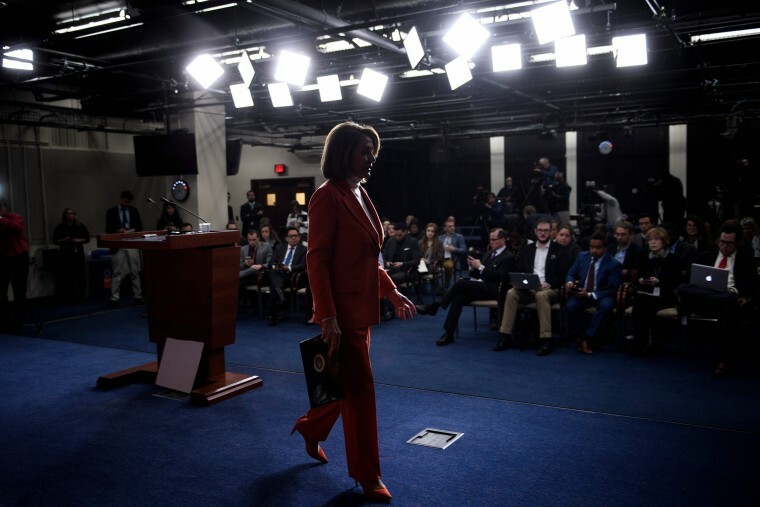 WASHINGTON — Sixteen Democrats on Monday released a letter announcing their opposition to electing Rep. Nancy Pelosi, D-Calif., speaker of the House, presenting her a narrow path to reclaiming the speaker’s gavel in the next Congress. The letter is the first concrete expression of opposition from current Democratic lawmakers and incoming members of Congress since the party won control of the House in the midterm elections. Pelosi, who served as the first female speaker of the House from 2007 through 2011, and has been the top Democrat in the lower chamber since 2002 — has been aggressively campaigning for the speakership amid opposition from a small but vocal group of incumbents within her own party who have long advocated for new leadership and several incoming members who won election pledging they would oppose her as speaker. Will Nancy Pelosi return as House speaker? “As we head toward the 116th Congress and reclaim our Democratic majority, we believe more strongly than ever that the time has come for new leadership in our caucus,” the Democrats wrote in the letter. "We are committed to voting for new leadership in both our caucus meeting and on the House floor," they added. A senior Democratic aide dismissed the letter and the effort. "If your strategy relies upon Nancy Pelosi giving up, you will lose every single time. Ninety-four percent of the caucus didn’t sign this letter," the aide said. The speaker is elected by the full House of Representatives and the winner must obtain the support of a majority of members voting. If a member votes “present,” then the number determining the majority decreases. Democrats are slated to hold 232 seats for the next Congress, with five races still yet to be called. If no member votes “present,” then Pelosi would have to win the support of 218 members, meaning she would not need the support of 14 Democratic lawmakers. Of the sixteen Democrats who signed the letter, four are newly elected. One signee, Ben McAdams, has not yet been elected, but currently leads Rep. Mia Love, R-Utah, in his uncalled race. The letter does not represent the totality of Democratic opposition to Pelosi. Two members who have contemplated running against Pelosi as speaker, Reps. Karen Bass, D-Calif., and Marcia Fudge, D-Ohio, did not sign on to the letter. Abigail Spanberger, who vowed to oppose Pelosi in her successful Virginia campaign, said on Friday after leaving a meeting with her that she would not sign the letter but would still vote against her. Could potential challenger keep Pelosi from speakership? Pelosi’s opponents do not yet have a clear candidate to run against her. Fudge said she would announce after Thanksgiving if she would jump in the race. Fudge did not add her name to the letter, just as Rep. Tim Ryan, D-Ohio, did not sign a similar letter against Pelosi to be minority leader in 2016 because he had decided to run against her. Pelosi spent much of Thursday and Friday of last week holding individual meetings with new members. She has also met with groups of Democrats as part of her outreach efforts, including the Congressional Progressive Caucus, the New Democrat Coalition, and the Problem Solvers Caucus. President Donald Trump tweeted over the weekend that Pelosi "deserves" to be speaker, adding that he "can get as many votes as she wants." He tagged Rep. Tom Reed, R-N.Y., the Republican leader of the bipartisan Problem Solvers Caucus, who indicated he would consider voting for Pelosi for speaker if she agreed to rule changes that would dilute power from leadership.